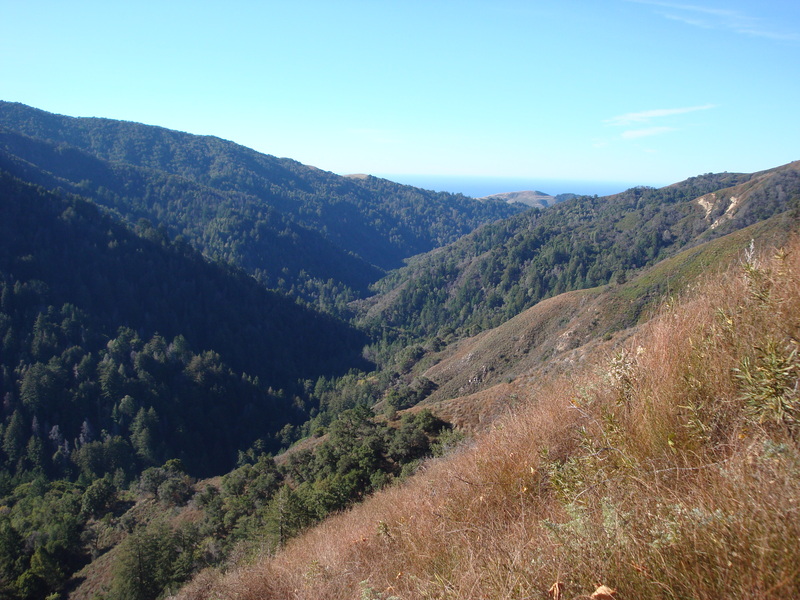 The North Fork of the Little Sur River, El Río Chiquito del Sur, passes between the lower slopes of Pico Blanco and Bixby Mountain on its way to the sea. Douglas Iris (Iris douglasiana) growing in profusion along the Little Sur Trail. Come spring, this should be quite a display. 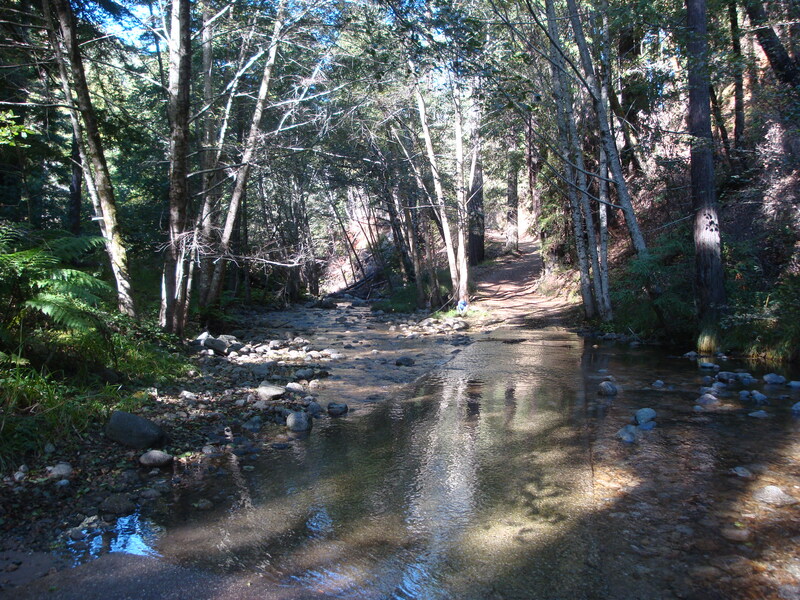 El Rillito: The ford at Pico Blanco Boy Scout Camp. The start of the trail to Jackson and Fox Camps does not look encouraging. 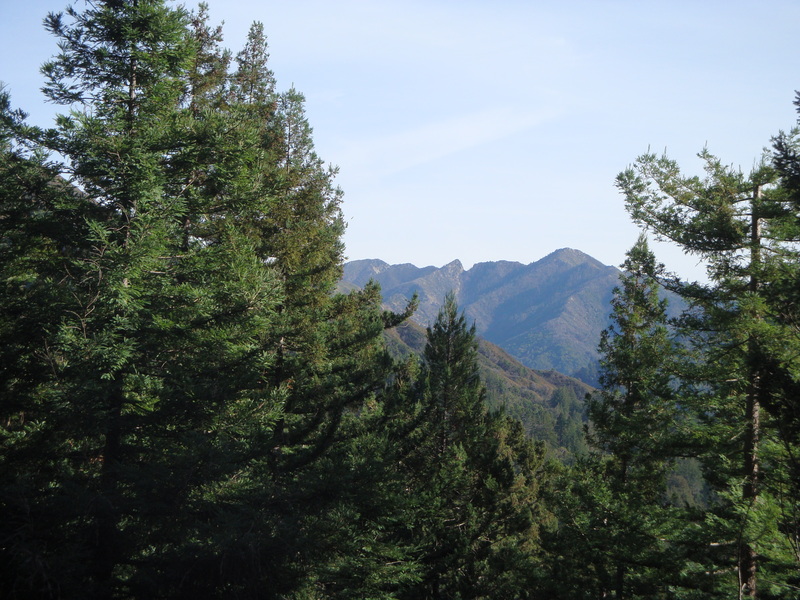 On the climb toward the South Fork, a massive Douglas Fir across the trail is easier to get around than it looks. 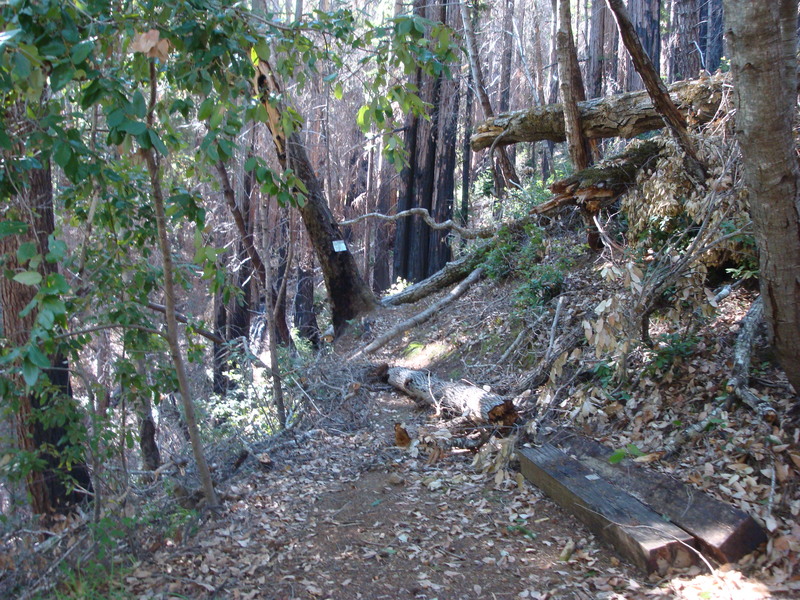 Same goes for an equally massive redwood suspended across the trail a little further on. These logs look more than big enough and more than awkwardly placed enough to satisfy any trail crew looking for a serious challenge. 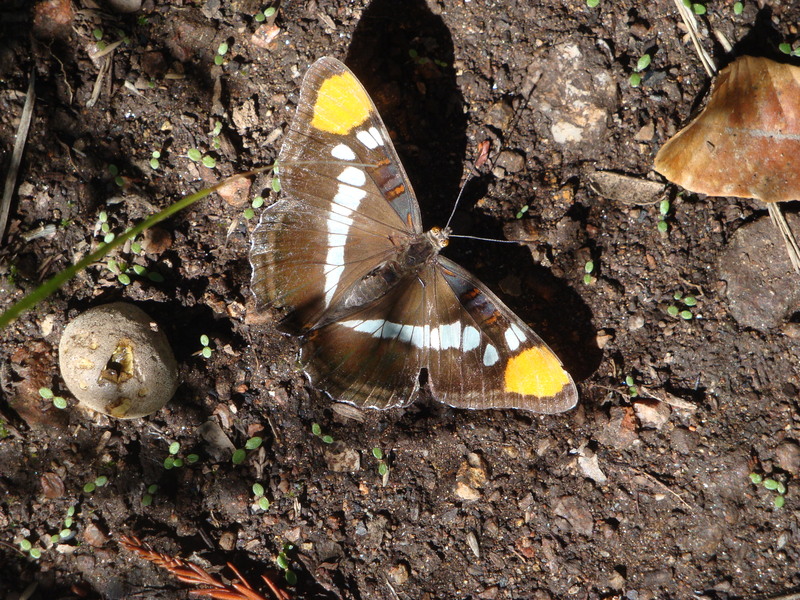 Denizen of live oak woodlands, a California Sister (Adelpha bredowii californica) alights on the forest floor. A fine mess. 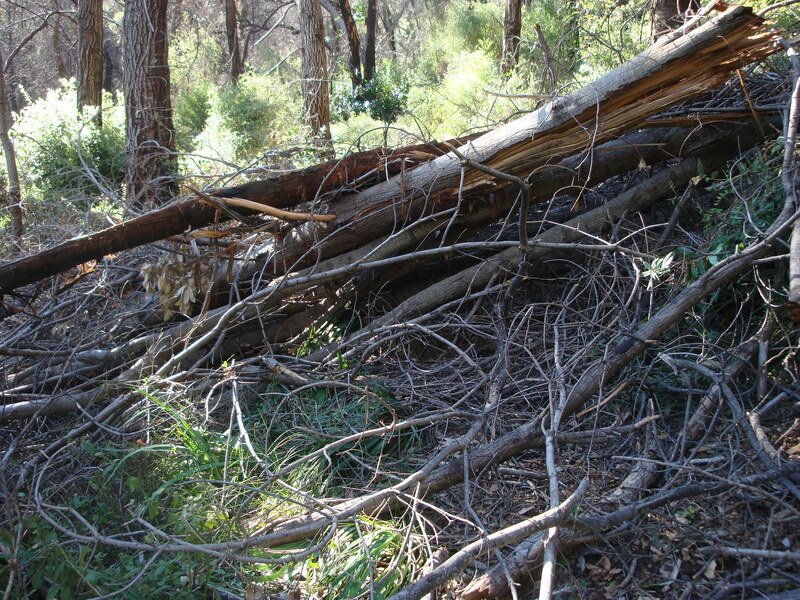 A classic “pile o’ logs” trail obstruction. 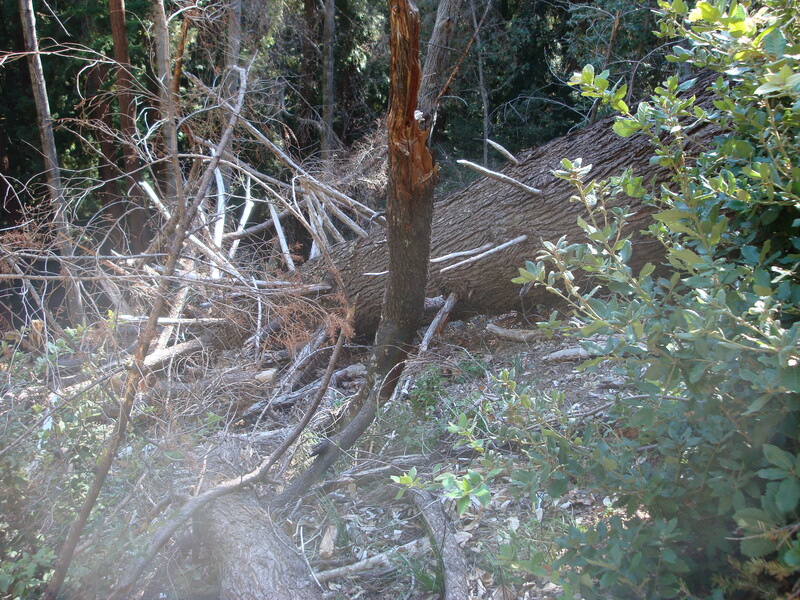 Fortunately, all the deadfalls between the Scout Camp and the Mt. Manuel Trail junction are easy to bypass. What fire? 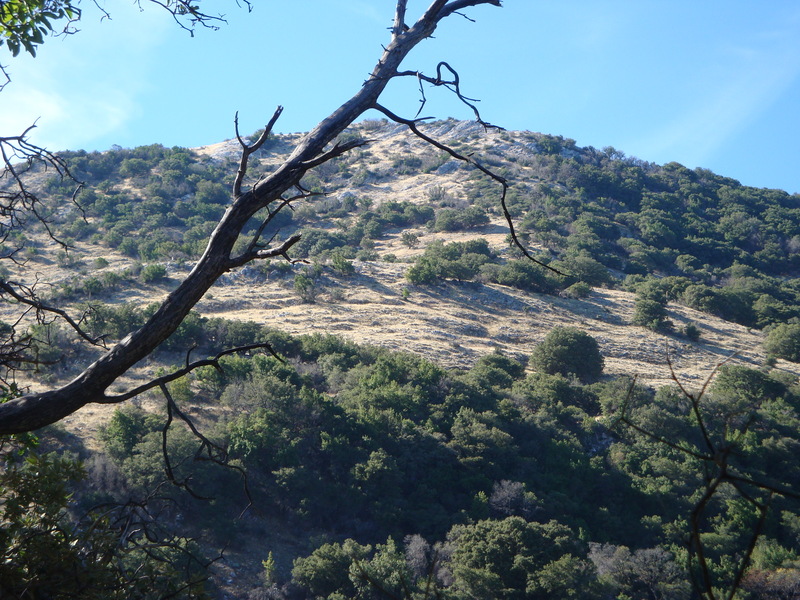 The park-like oak groves on the eastern shoulder of Pico Blanco survived the Basin Complex Fire with no apparent damage – in spite of the fact that they hadn’t seen fire in who knows how long (the Marble Cone and Kirk Complex Fires both missed them). 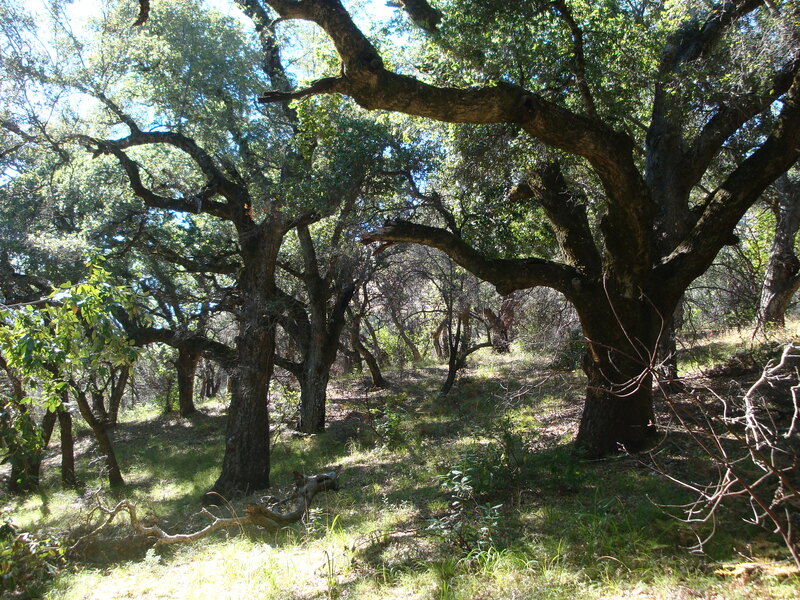 One thing we’ve learned in wandering through the Basin Complex burn is that large oaks are a lot more resistant to fire damage than we would have guessed. “Steep sea-wave of marble” The eastern face of Pico Blanco. 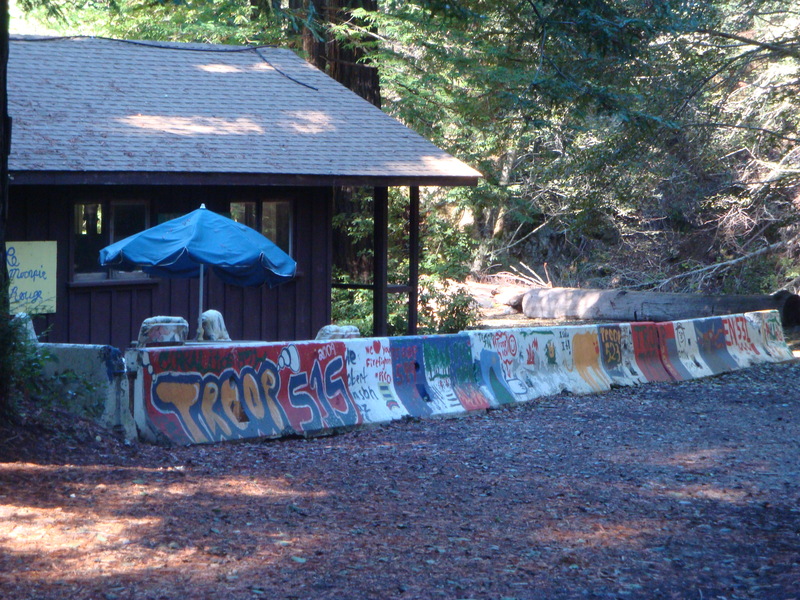 Wall where scouts have been working to earn their graffiti merit badge. This entry was posted on Sunday, November 14th, 2010 at 6:05 pm and is filed under Big Sur, Insects, On Foot, Plants, Santa Lucias. You can follow any responses to this entry through the RSS 2.0 feed. You can leave a response, or trackback from your own site. 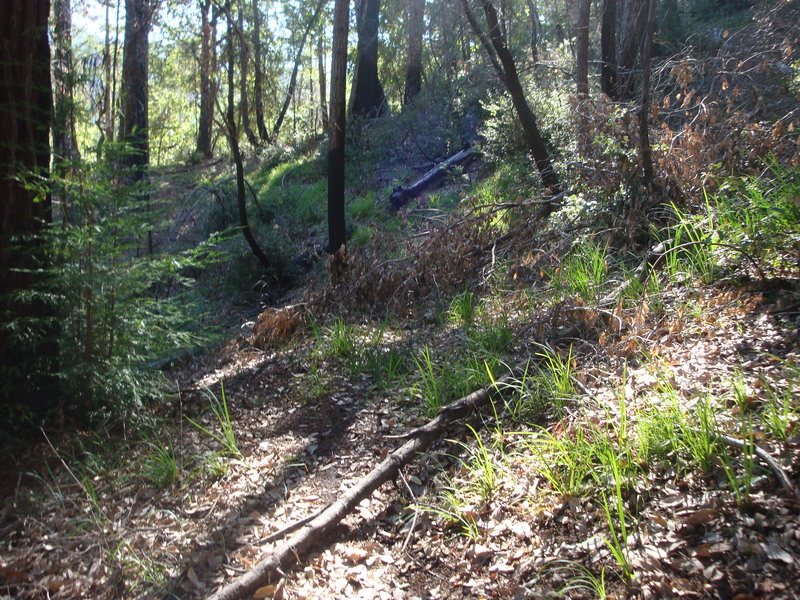 Did you really slep the 4+ miles of the Pico Blanco Boy Scout road to begin this hike — or did genii loci enable you to bypass this unsavory segment? The gate was unlocked, but we didn’t want to miss out on the stimulating experience of walking the road while “hunters” on the fire break above the parking lot gave us the traditional Bottcher’s Gap salute, by firing dozens of volleys over our heads – both going and coming. 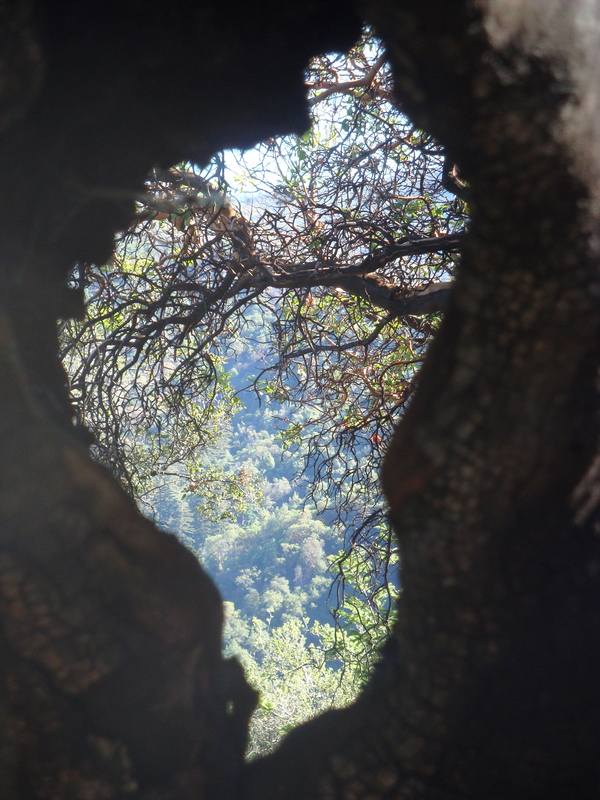 The crisp air and the ever-changing views of the Window and Pico Blanco made the trudge along the road worth it, though. 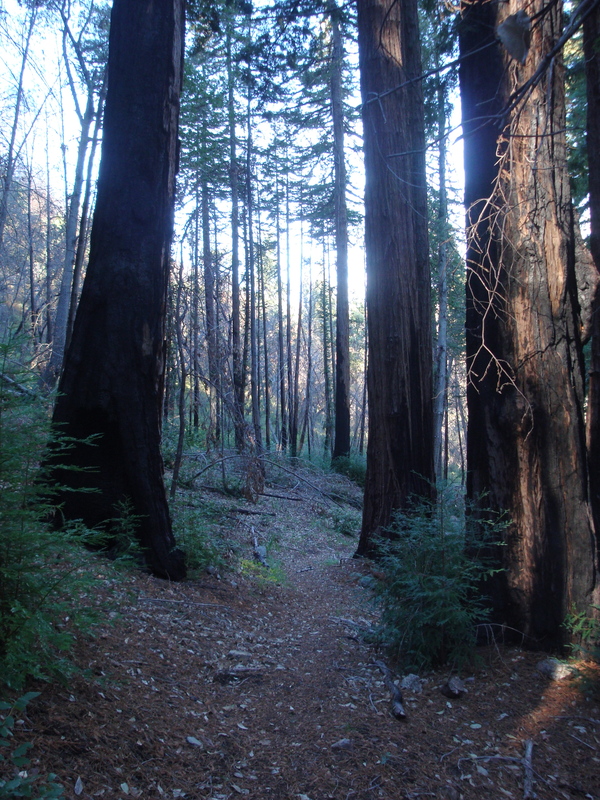 And walking’s the only way to really appreciate the sudden change from sun-baked chaparral to damp Redwood/Doug Fir forest. If you are anyone is interested in the deal with those K-Rails that are painted on, they were placed there for flood damage prevention after the Basin Complex Fire and must remain there for about 3 years. It was part of a larger flood control project throughout the camp including megabags and stockpiling. Someone got the idea that the white K-rails were ugly, and it would be a good idea to let each troop have an art project and give them buckets of paint to put whatever on them. For more info check Monterey County record BDA080002. Just a tiny bit more evidence of the camps continual “man vs nature” attitude of land management. Oh, and just to avoid confusion, the public may never drive down the dirt road past Bottchers Gap even if it is unlocked or even wide open unless specific permission is granted. Beautiful photos – every one of them. Thank you. Yes indeed. A lovely gallery. Thanks.